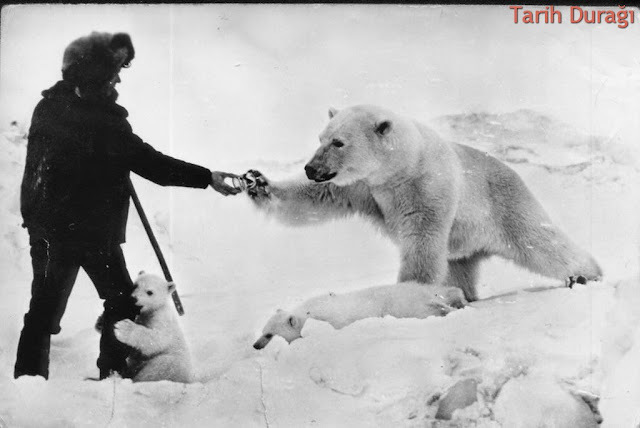 Photo taken during a routine military expedition in Chukchi Peninsula, Soviet Union. It isn’t sure if the Chukchi Peninsula has more people or white bears. The climate is very severe and sometimes weather can be so fierce in winter that the temperature falls 40 C degrees below zero (-40 Fahrenheit) so that poor white bears and their cubs start starving and freezing. 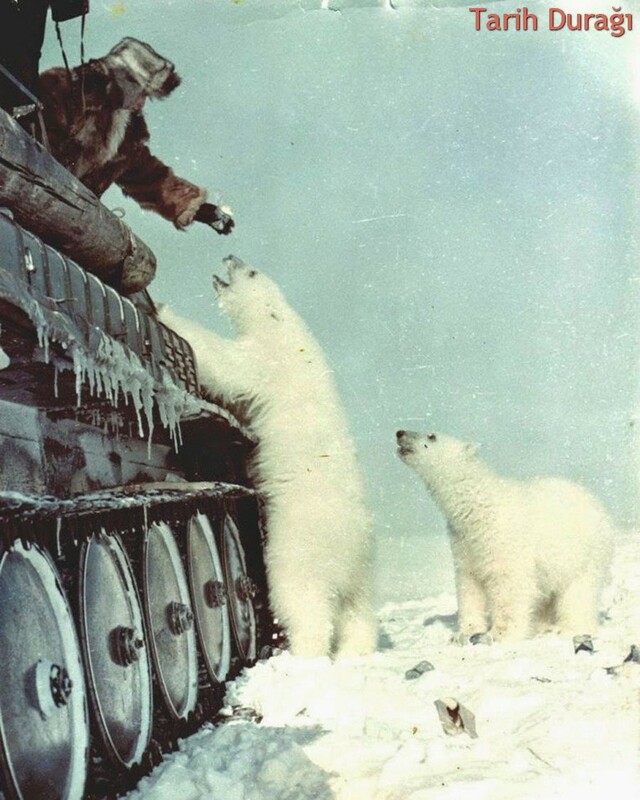 The soldiers, who served on the Army District of Chukchi Peninsula, didn’t turn their backs on the poor and starving animals and started to feed them every now and then. Of course you do not have such big amounts of meat at home to feed several white bears. 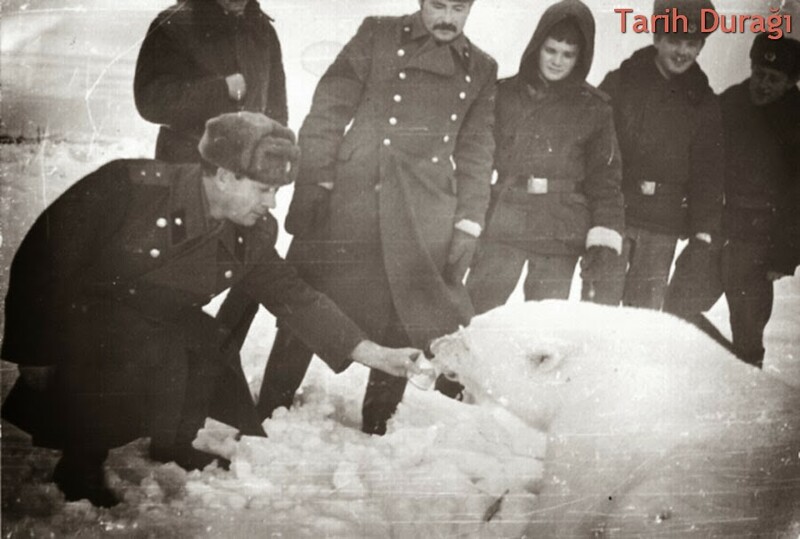 And soldiers decided to feed the bears up with what they had in abundance – tins, or to be more exact, condensed milk. Soldiers would open such a tin with a tin-opener and then give the can to the bear who licked all the milk from tin and then feed her little bears with it. Those blue and white tins of condensed milk were the winter dessert staple of every Soviet kid. The condensed milk (called in Russian: sgushchennoye moloko) had indeterminately long shelf life and there was always plenty of it. It was a common dessert in the army too. It isn’t surprised to see it given away to bears, because unlike some stuff that was rationed the condensed milk in USSR was available in unlimited amounts.